and went over to smell it. Smell the diference, and accept that tere is no difference in the supreme energy,no matter how exotic the forma appears in 3D. Then it slowly gets absorbed. "Unusual and different" is always the feeling we get from sth we are being introduced to. Smelling is the first part in examining the introduction. The buds of the not-yet-opened flowers (unripe blossoms) that surround this flower are Crystalline, diamond-like crystal buds. Furthermore, the stems of the unripe Crystal Buds are a Lower Frequency Base colour (orange/yellow)....while the blossoming ripe flower has achieved the Higher Frequency EMERALD GREEN base colour of the 5th Dimension. Once the Crystalline Light Body process is complete (represented by the immature diamond buds), a Being then fully blossoms by transforming from the Crystal phase to the Etheric/Plasma phase of the Light Body. The Emerald Green leaves are in Photosynthesis-style, open and receiving of the Higher Dimensional Light. When a comet approaches the sun, its core sublimes. "sublimation means a solid going straight into a gas without passing the state of liquid. Something solid drifts apart into its molecules, into its atoms – no violence, no explosion, just something that was solidly there coming apart into a vapor and rising quietly, transcendently, exaltedly." 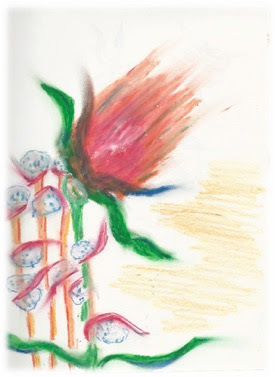 The more I am staring upon the "Flower", I have noticed it is getting more and and more influenced by the white light and gradually is loosing it primary colour of "magenta". It's fascinating that millions of people in the past decade are constantly using "loosing" instead of "losing". What's up with that??? Obviously another metaphor...to let "loose", to free up....instead of us being "losers" all the time, prisoners & victims --- we are now "loosers". "Sue, is this real or its my imagination? :)"
What do you think is the DIFFERENCE? Your imagination IS the reality. IMAGINATION is "real" --- everything else is the illusion. Your "real"ity exists first, in your Imagination -- you see, when you think ANY thought, you are literally generating/sending out Thought Clouds that HAVE to exist somewhere. Initially these Thought Clouds of Energy exist in the higher dimensions, such as the 6th dimension, in our universe. Then they have to make their way back down to our 3D level, in order to show up/manifest as "physical" matter in our "real"ity. Everything you are looking at is IMAGINATION energy, made physically solid. Hold on. The Light is coming. You can breathe deeply and absorb the frequency of the Light. good morning everyone!somos receptores de una potente energia como antenas y atraves nuestro como si fueramos cables la energia circula hacia gaia y esta energia de amor nos esta haciendo florecer y a su vez nos estamos empesando a brillar con otros colores pero la percepcion es individual .